Ebba Larsdotter Sparre (1629 – 19 March 1662) was a Swedish lady-in-waiting and noble. She is known as the intimate friend and speculated lover of Queen Christina of Sweden. Ebba Sparre was the daughter of statesman and marshal Lars Eriksson Sparre and Märta Banér and grandchild of chancellor Erik Larsson Sparre. She arrived at court in 1644, where she was appointed hovfröken to the queen. Sparre was a celebrated beauty at the royal court and nicknamed La belle comtesse. She frequently played the part of Venus in the amateur ballets performed by the nobility at court. 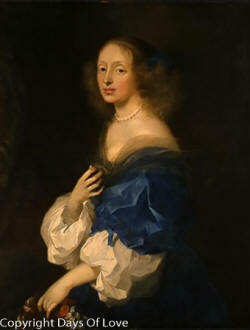 Her intimate relationship with Queen Christina gave rise to the speculation that they were lovers. This has never been confirmed. However, she did belong to the few women Queen Christina showed an interest in during her life in Sweden: with some exceptions, such as Ebba Sparre, lady Jane Ruthven and Louise van der Nooth, Christina did not show any interest in her female courtiers, and generally mentions them only to express contempt over their femininity and portray herself as more masculine than them. In 1639 she mentions her attitude toward her ladies in waiting in regard to Beata Oxenstierna and her daughter, maid of honor Märta Ulfsparre: "The Mistress of the Robes Lady Beata Oxenstierna and her daughter arrived just now. The more of them that comes here the worse it is". Most of Christina's spare time was spent with "la belle comtesse", and she often called attention to her beauty. She introduced her to the English ambassador Bulstrode Whitelocke as her 'bed-fellow', assuring him that Sparre's intellect was as striking as her body. When Christina left Sweden she continued to write passionate love-letters to Sparre, in which she told her that she would always love her. However, such emotional letters were relatively common at that time, and Christina would use the same style when writing to women she had never met, but whose writings she admired. Ebba was engaged to Bengt Gabrielsson Oxenstierna but broke the engagement to marry Count Jakob Kasimir de la Gardie, brother of the queen's favourite Magnus Gabriel de la Gardie, on the initiative of Christina. They married in 1652. The marriage was unhappy. Sparre was the only female favourite of Christina, and they kept in touch after Christina left Sweden. In 1661, Christina invited Sparre to visit her in Hamburg, and she also wished to see her during her visit to Sweden, but this was prevented by Sparre's family. Sven Stolpe (Swedish): Kristina: Drottning & Rebell (Christina:Queen and rebel) (2004) p. 56.